The major supplier of computers and electronic products, Asus, has announced the latest member of the Seashell series which named as Eee PC 1101HA. 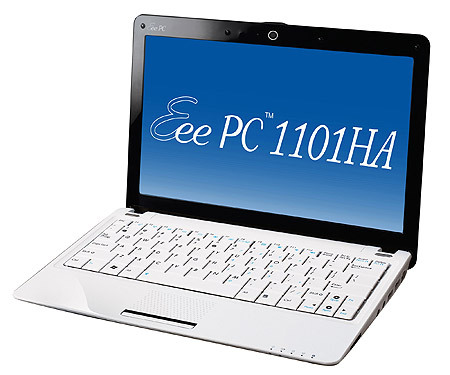 Eee PC 1101HA comes with a spacious keyboard, a trackpad similar to that seen in the 1008HA. The new mini netbook features 11.6-inch LED display, Intel Atom Z520/Z530 1.3GHz processor instead of the Atom N280 line that other Seashells come with, 1GB RAM, and 160GB HDD. The new Asus Eee PC 1101HA will have two options for its 6-cell battery that is 2220mAH and 2800mAh. The option of 2220mAH will offer up to 9.5 hours for its battery operate time and 2800mAH will offer up to 11 hours battery life. Asus is also planning a model that will come with 3G called the Eee PC 1101HGO. To compensate for the additional power drain from 3G, it will be fitted with a slightly larger battery (that protrudes out) than the one found in the 1101HA. The new Asus Eee PC 1101HA mini netbook currently available through leading retailer but the price has yet to be announced.